Murrayfield will host the 2016 Guinness Pro12 final on 28 May. 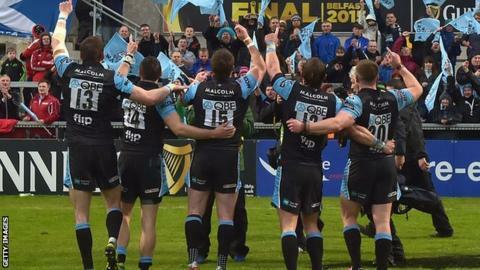 It will be the first Pro12 final held outside Ireland and the second time at a pre-determined venue, following the 2015 climax at the Kingspan Stadium. Edinburgh saw off bids from the 11 other Pro12 clubs and their regions in order to stage the event. Pro12 chief executive John Feehan said: "Edinburgh is well known as an inspiring host city for sports, arts and cultural events." He added: "The tender was outstanding and was unanimously agreed as the chosen venue." Speaking at the announcement from Edinburgh Castle, Scottish Rugby's Dominic McKay said: "We are extremely pleased that our bid was successful and we have the privilege of hosting such a prestigious final. "We want to celebrate the climax to the season by welcoming fans from all Pro12 clubs to the final, to what promises to be a fantastic sporting event." Tickets will go on public sale on Tuesday, 15 September.